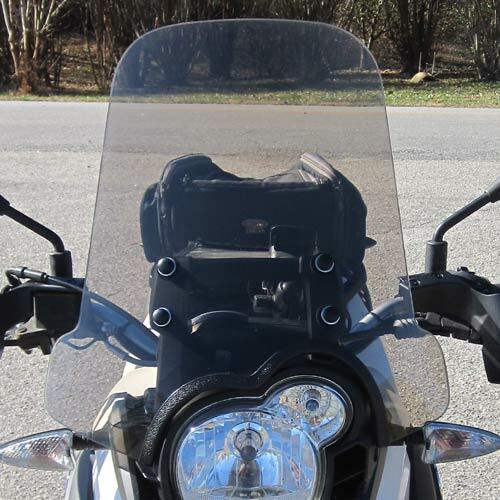 The new Parabellum Rally windshield for the 2011 to present BMW G650GS is perfect for those riders that want to get the most out of their bikes off-road while still wanting significant on-road wind protection. With an upright angle similar to Dakar Rally fairings, the rider will be protected from off-road debris as well as turbulent wind on-road. The Rally shield was designed for riders using their G650GS half on and half off-road. This wind guard is 16 inches wide at the bottom tapering to 11 inches wide at the top and made of the same 3/16 inch cast acrylic as the Touring version.